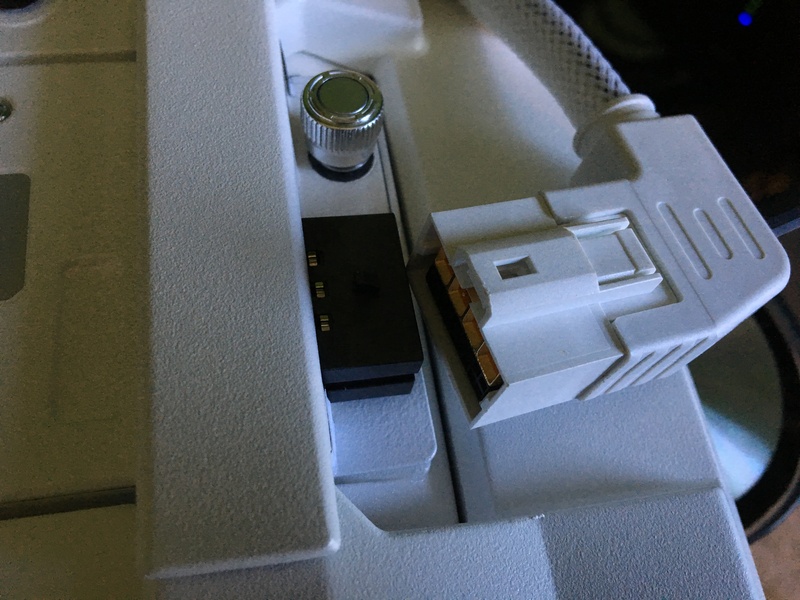 Inconspicuously located on the side of the AP, behind a little door, the new DART connector reveals itself in a complex looking array of pins and connectors in a tight external facing form factor. 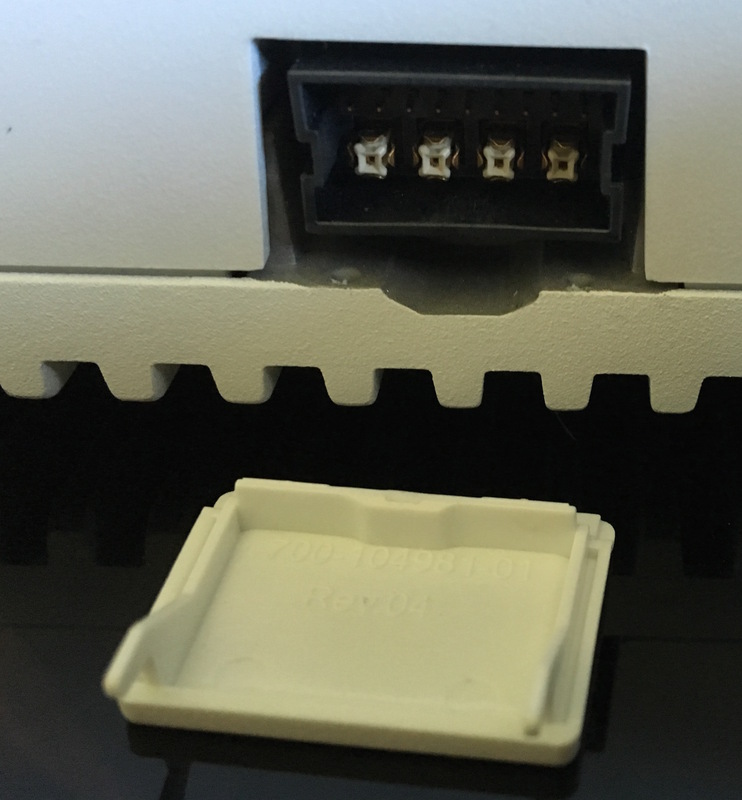 Here’s the interesting part though, this isn’t a new connector! In fact, it’s been shipping to the public for a little bit now in the form of the Cisco Hyperlocation module and antenna! 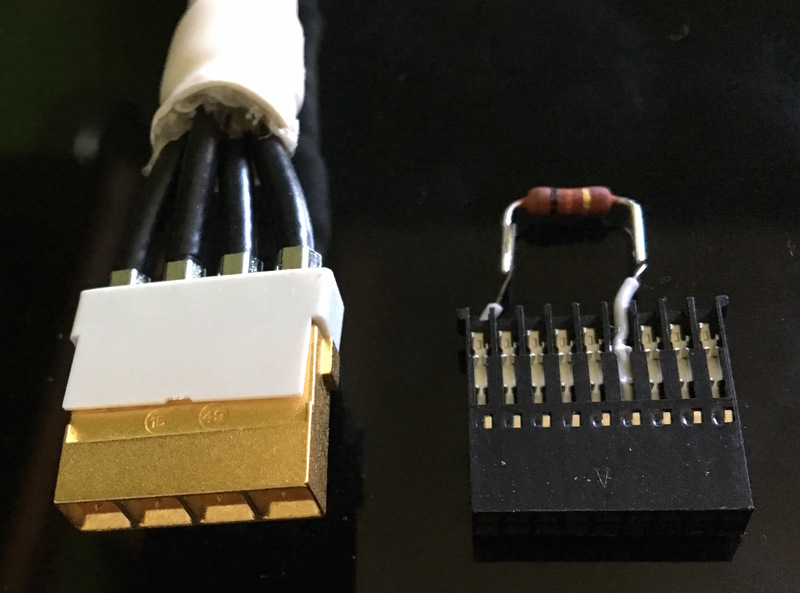 So, that’s all great and all, but what’s really *in* the DART connector? DART stands for Digital Analog Radio Termination and it does all of those wonderful things. 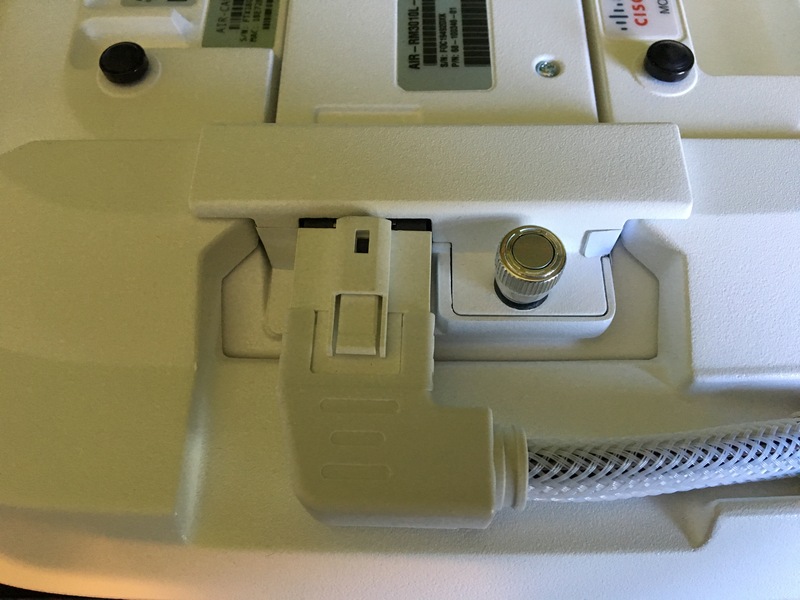 Firstly, the analog antenna connectors that we use (so we don’t have 8 RP-TNC ports on our AP) are the 4 larger pins across the bottom of the connector. Look at all those pins! 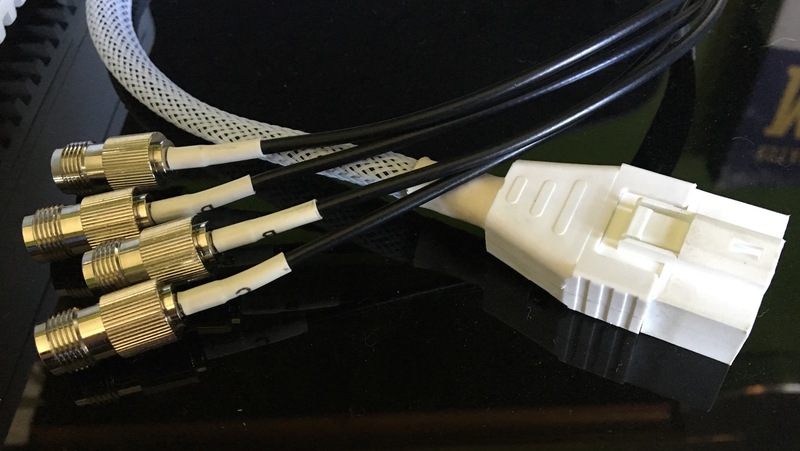 When we use the DART to RP-TNC pig tail for backwards compatibility with shipping antennas, these are the connectors that map directly to the 4 RP-TNC connectors. 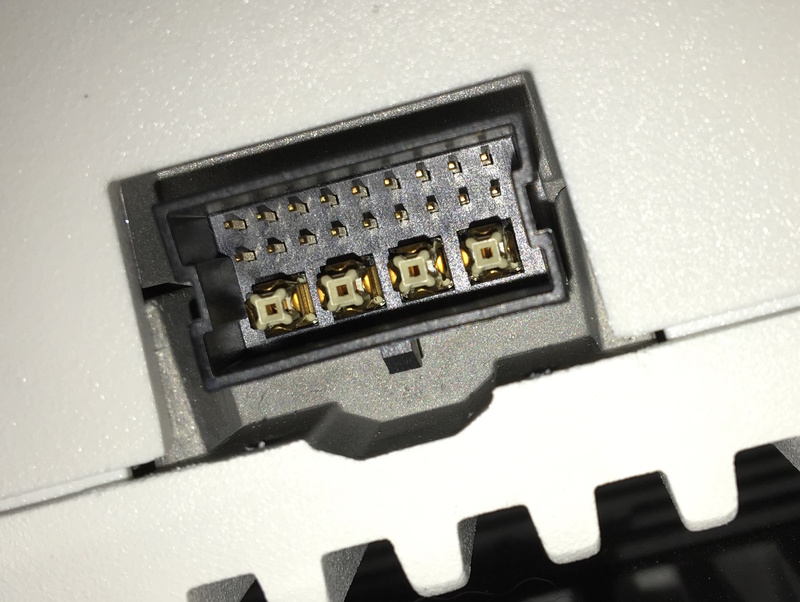 In short, these are the 4 analog ports that carry the actual analog signal through the connector. 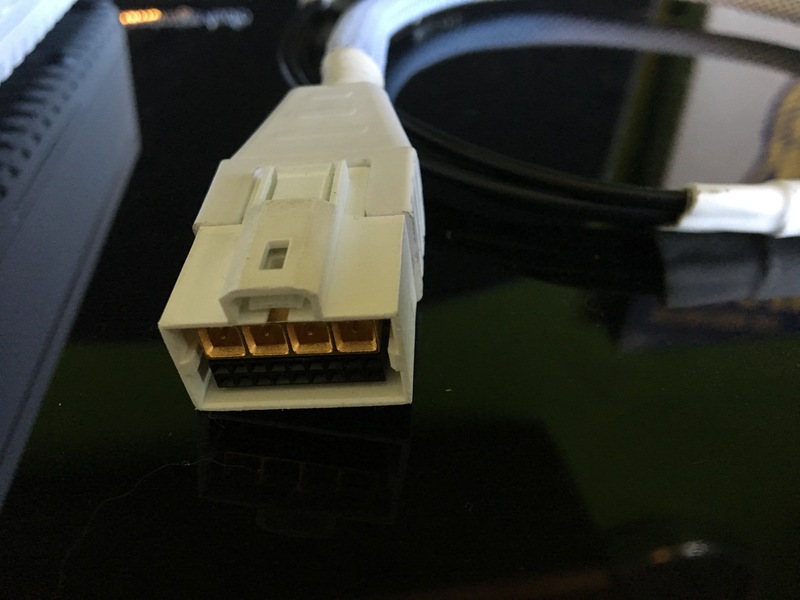 It’s easy to see that there’s quite a bit of left over functionality that could be used in a connector of this type. 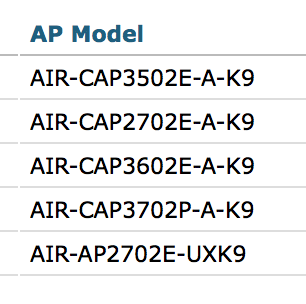 Today if we use very high gain antennas we have to have multiple models of APs (see the 3602p and 3702p). If we could identify the gain of the antenna by way of an automated mechanism, we could have the AP auto adjust itself to not exceed EIRP. 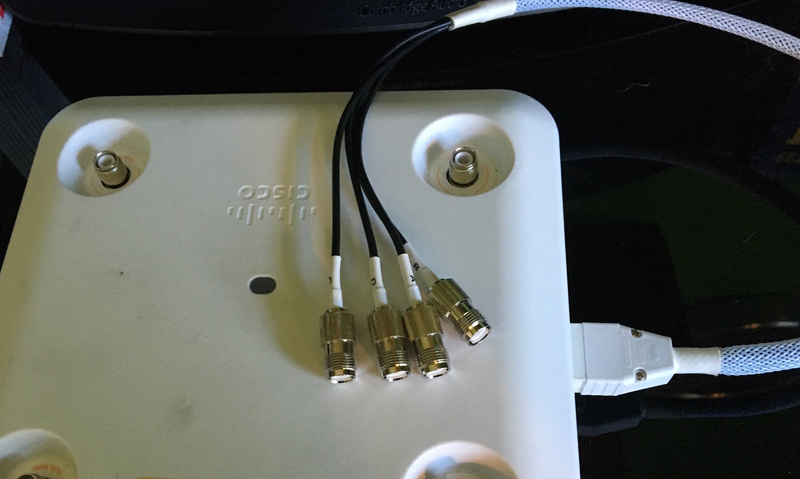 Another potential use case is DART native versions of our existing antennas in a simple to use connector. Imagine not having to screw on connectors anymore! 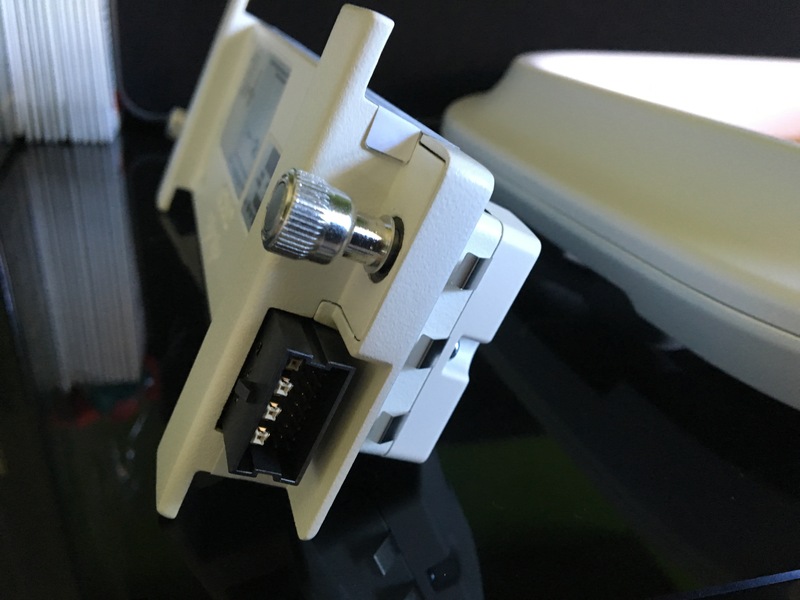 With a quick-connect antenna mechanism that auto-IDs the antenna capabilities to the AP, this could certainly be the new connector of choice for external antennas in the future! With DART connector on edge. Note the DART connector on the left. In the wireless world, we’re constrained by regulatory requirements. 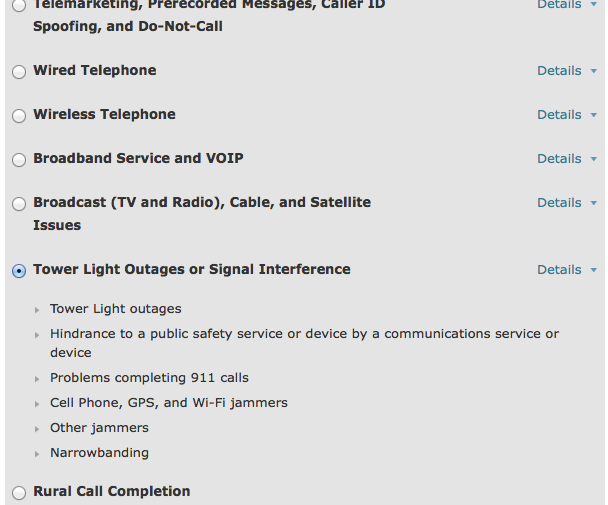 These are, at their core, different rules by which we must abide by when we’re operating wireless equipment. Each country has their own set of requirements and restrictions – each manifesting itself in some iteration of channel availability or power limitation of some sort. Until now, this meant that each country had to have it’s own regulatory SKU to prevent a wireless professional or other ‘non-professional’ installer from exceeding or violating that countries requirements. Cisco has worked around this particular issue with a universal SKU Access Point. In the past you would order a specific AP for a specific country. The astute Cisco-configurator would identify the country code in an AP model number (A for North America, N for Mexico, I for Egypt, etc.). The gory details of country code mapping changed occasionally which meant that it was almost a full time job for international companies to wrangle which SKU went where. UX domain model of AP, last in the list. Enter the ‘UX’ SKU of AP. These APs are designated by the country code ‘UX’ and are universal SKU APs, meaning one SKU can be installed in any country. The way we’re able to do this is by way of software defining which country the AP is operating in. Now, the FCC won’t just allow you to ‘claim’ a country code, so there are some specific restrictions to deploying a ‘world capable’ AP. 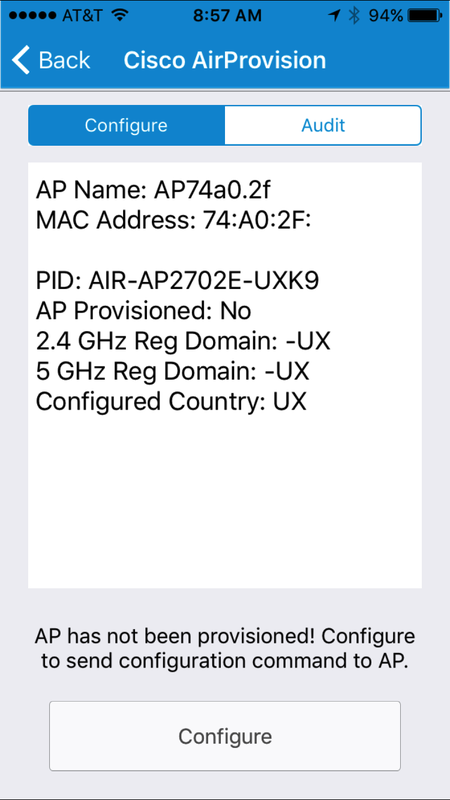 Today, this means tying the AP to a specific user, then using a non-hacked device to determine GPS coordinates of where the AP is installed to ‘prime’ or ‘unlock’ the AP based on what country it’s physically located in. 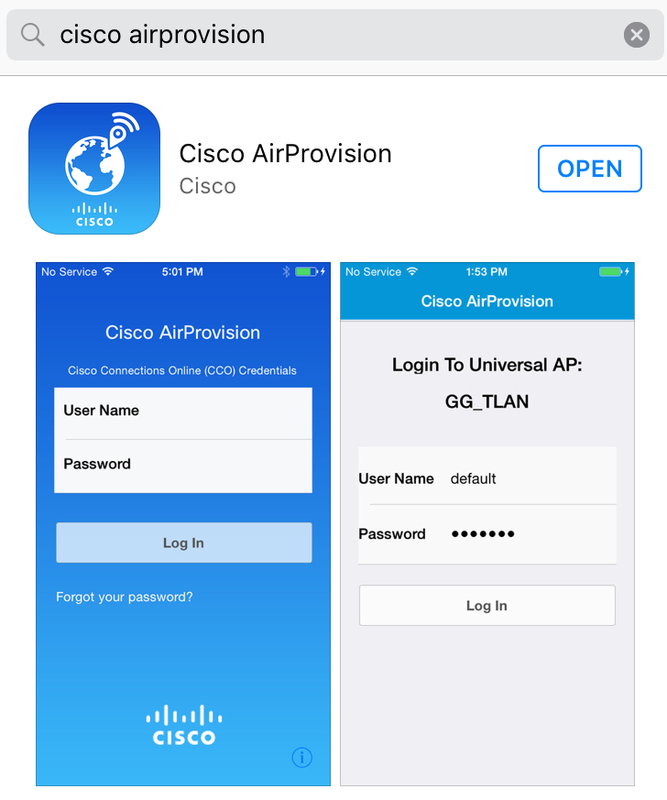 Step 1) Head to your devices respective app store and grab the Cisco AirProvision application. Step 2) Plug in your AP and let it join to your WLC (this assumes you have things like discovery already taken care of). There are no UX specific join requirements so if you have regular Cisco APs joining your WLC, this part should be easy. Note that at this point the AP will be flashing ‘bad colors’ at you despite it’s radios being up and operational. Step 3) Enable ‘Universal AP Admin’ on one of your secure (PSK or .1x) SSIDs that has internet access (WLAN tab -> WLAN ID -> Advanced tab -> ‘Universal AP Admin’). Step 4) Join the above SSID on your unprimed AP. Step 5) Launch the app on your smartphone and log into CCO (page 1) then your WLC (page 2). That’s it! It’s a relatively straightforward way for your AP to know what country it’s at. The good news is that you only ever need to prime a single AP in this fashion. Once it’s primed and comes back online, it will automatically include in its Neighbor Discovery Packets (NDP) UX domain info. Any other unprimed AP in earshot of these discovery packets will hear them and automatically pickup the country code of the already primed AP! Once you have primed a second AP by way of the NDP the priming sticks with the AP and you can then prime others off it in a cascading fashion – you can even re-prime the AP that you previously primed with the app! While this may seem like unnecessary work for those that are single country entities, those that have to operate in multiple country codes may find that simplified ordering is a lifesaver – assuming your installers have a smart phone and a free CCO account. This can also help if your company accidentally ordered several hundred of these and you don’t want to RMA them. Remember that the country code priming sticks with the AP across reboots, regardless of location (unless you re-launch the mobile app to reconcile your installation). Your smartphone must allow location access (it has to know where you’re at after all). You must join the SSID on your unprimed AP. Joining on a different AP won’t help you any. You have to have 2.4GHz enabled on your WLC and SSID – an unprimed AP operates in 2.4GHz only so you have to be able to see your SSID. You must have the country code you’re provisioning enabled on the WLC (Thanks Andrew!). Your SSID must have internet access to allow CCO to be accessible. NDP priming only works on other NDP primed UX domain APs or app primed UX domain APs – not ‘regulatory domain APs’. Did you screw something up? You can reset the UX domain AP by performing a ‘Clear All Config’ on the AP page in the GUI (along with all of it’s other settings)! When your AP primes, it reboots. This is the same if you use the app or NDP. Don’t be surprised if you app-prime one AP and it cascades a bunch of NDP reboots. *Oct 26 14:19:50.507: %SYS-5-RELOAD: Reload requested by UAP DIE process. Reload Reason: UNIVERSAL AP PRIMING SUCCESSFUL . You can see above the log from an AP that was previously online. This AP was unprimed when it powered up, came online with radios up and then after several minutes received the NDP prime message and auto-rebooted. Easy, but potentially disruptive! There is a group of WiFi Professionals (me included) that just can’t let go of their Cognio based products. With the Cisco purchase in 2007 (which ultimately manifested itself in the CleanAir product) we have seen a slow but steady decline of high-fidelity PC based spectrum analyzers. We’ve seen people try to compete in a variety of ways; with lower fidelity devices (Metageek) or with the high cost BandSpeed based product (AirMagnet Spectrum XT) but it’s not rare to find a wireless professional still lugging around an old laptop to use their Cognio based (AirMagnet Spectrum Analyzer, Cisco Spectrum Expert, or Cognio Spectrum Analyzer) CardBus Card. It seems unlikely that we’ll see a USB based Cognio product anytime soon (if ever) so I thought it was high time to figure something else out. Option 1) For years many of the lager laptops from Lenovo (and even Apple!) have sported ExpressCard slots. 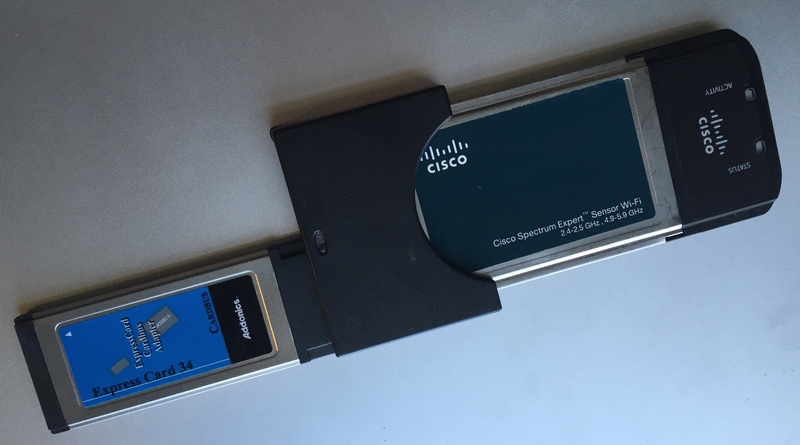 By using an Addonics ExpressCard34 to CardBus converter, you can load the Cisco Spectrum Expert software on in Windows and your card works just fine! It requires an ExpressCard34 slot on your PC. There are several converters on the market. Some work, some do not. Make sure you get one that maps the PCIe bus, not the USB bus. It’s bulky the whole card fits outside of the machine and it’s not very pretty. Option 2) The Sonnet Echo ThunderBolt to ExpressCard34 adapter will allow you to take the above Cognio/Express card solution and map it to ThunderBolt compatible interface on your laptop. 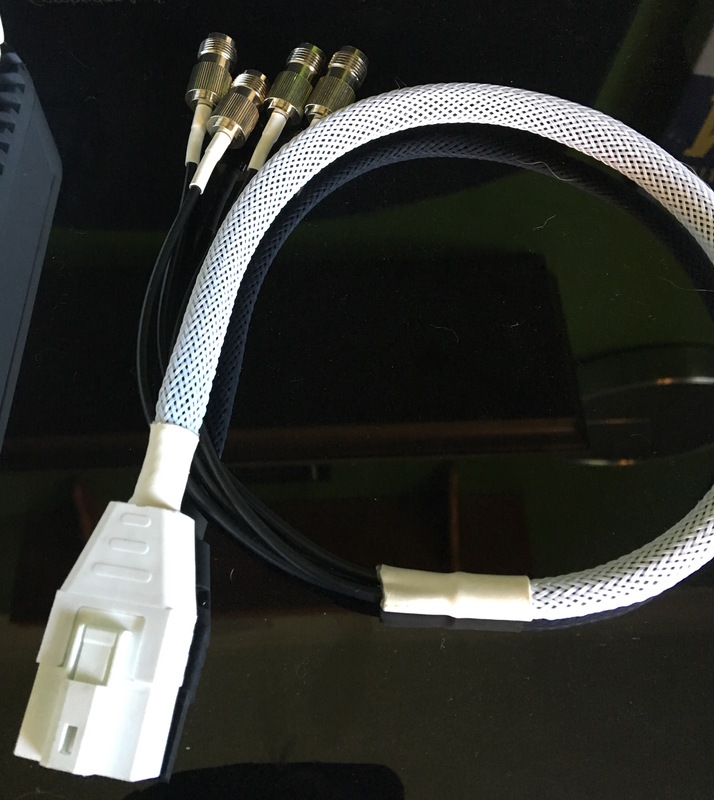 This means that any MacBook past the Early 2011 MacBook Pro (which I’m using) or any PC with a ThunderBolt compatible interface (many modern Lenovo machines) now have a cable-attached (important for flexibility) way to use their Cognio, PC-based Spectrum analyzer on new hardware! It works without having a built in ExpressCard slot! 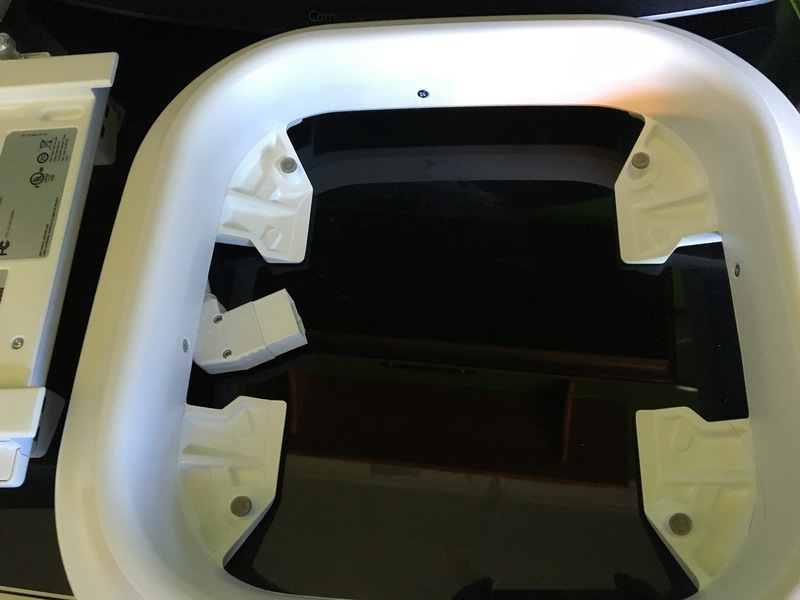 It’s cabled so you can move/relocate the whole bulky assembly to the back of your laptop lid easily. 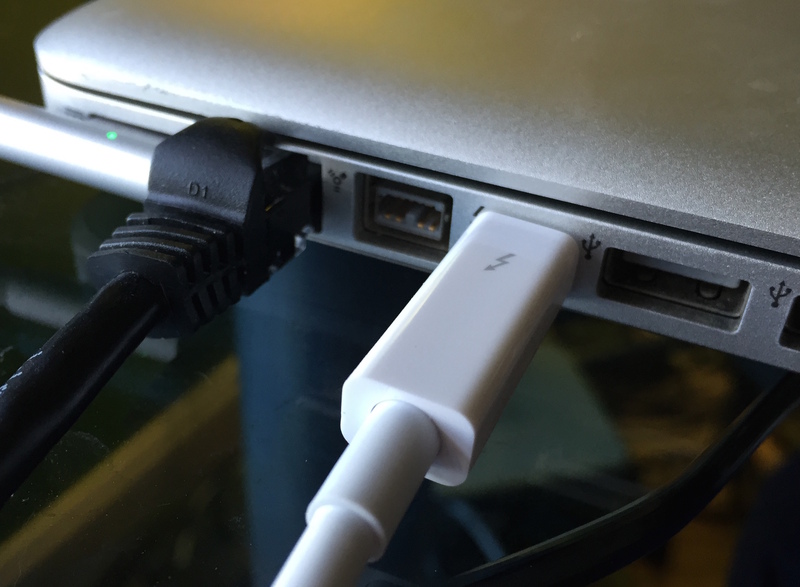 It requires a ThunderBolt port on your laptop. It should be noted that both of these solutions will not work through a hypervisor (VMWare Fusion or Parallels, for example) and require direct access to the PCIe bus – this means running Windows natively on your hardware. You Mac users, this means BootCamp. It should also be noted that many people call ThunderBolt many things and there are several varieties of the bus. Make sure it’s not a DisplayPort only interface! In short, if you’re still lugging around an old laptop just for this (or any other wireless CardBus based adapter), you now have a solution that’s cheaper than an new AirMagnet card and far less bulky than carrying around that crusty old XP machine. It’s time to upgrade! My wireless literally burns me. WARNING: this post includes uncensored pictures of a potentially provocative area of my body. While not Rated R (or even PG-13) you are hereby warned to avert your eyes if you believe that you may be even mildly offended or worse, intrigued. When I was younger I had a lighter leak in my pocket. 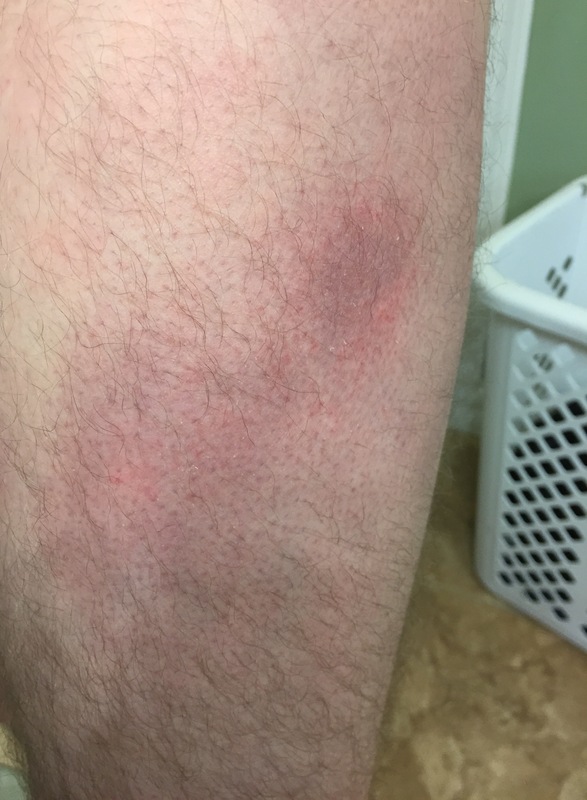 Unbeknownst to me, lighter fluid leaked all over my upper thigh and by the time I realized it, I had a hand-sized chemical burn where my pocket normally rests on my thigh. After some time (and discarding an otherwise perfect pair of pants!) the irritation went away. Fast forward to several years ago and I noticed a similar ‘irritation’ forming on both of my upper thighs underneath my pockets. 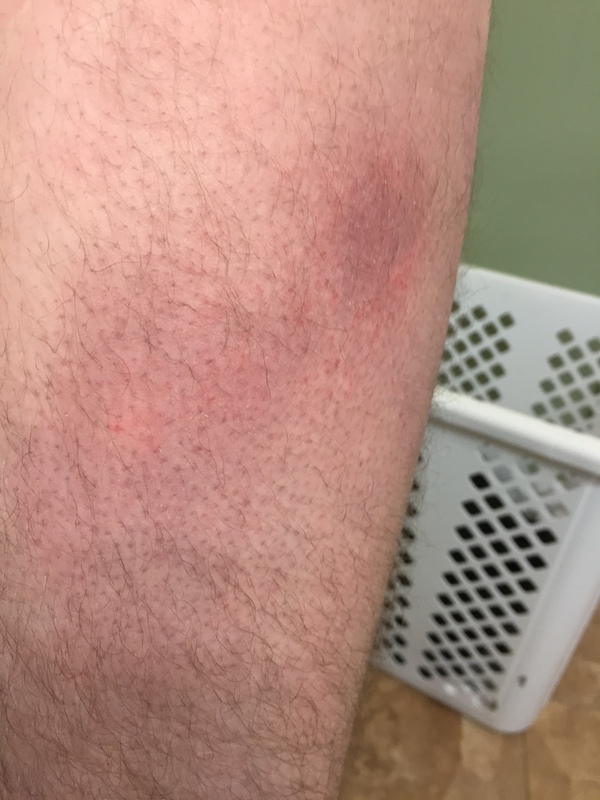 Since I’m a fairly light skinned guy – not albino, but still pretty light and pretty susceptible to sunburns in general, I wrote it off as pocket irritation. I couldn’t find any reasonable rhyme or reason to the general pocket-sized redness and irritation that I was experiencing but didn’t pay it much attention. Being, what I consider a professional in my industry, I recently decided to ‘up my wardrobe’. As a reasonably tall fellow I opted for custom pants among other things and the particular pants that I received included a right-hand pocket-in-the-pocket that was a perfect fit for my wallet! (Follow me here) When I started wearing said new pants, I consistently kept my wallet in the small right pocket which had the side effect of keeping my left pocket as a perfect place for my phone! I started getting into the habit of keeping my phone in my left pocket even when I wasn’t dressed for work. Then one day I noticed, the light, even, and spread out irritation that I used to carry on on both of my upper thighs started getting really bad on my left side – immediately under where my phone fit and has completely disappeared on the right! Now, I’ve been around the wireless industry for a while now and I’ve heard it all the way up to wireless gives me headaches, so I’m not one for conspiracy theories, but the skin irritation that has followed my phone (and cleared up where my phone no longer is!) has given me a good reason to re-consider the potential risks that may be involved in wireless networking. My phone has not gotten hot, so I’m left with assuming that the skin irritation I’m experiencing is being caused by nothing short of energy radiation burns (not radioactive, silly!). Maybe it’s WiFi, maybe it’s cellular, maybe it’s bluetooth? Does it matter? Now, I’ve not been to a doctor to have my burns officially evaluated (trying to not get a ‘don’t stick your finger in your eye if it hurts opinion) but there is a clear correlation between the location of my phone and the burns and irritations I’m personally experiencing. Having said all of that, I’m curious what you, the reader thinks. What do you think about my burns that have clearly followed my phone? Are short-range, long term exposure issues real? I for one will be distancing myself from my device until my burns go away, and likely for some time to follow. Here in the states, we have a regulatory body called the Federal Communications Commission (FCC). As it pertains to the Wi-Fi world, they tell us what channels we can use how obnoxious we can be (strength) in those channels. We have what you would consider to be a ‘blanket rule’ that basically states ‘within a given number of frequencies, you can do anything you want as long as you limit yourself to a maximum power’. A very intentional byproduct of these rules is the relatively low cost of WiFi components. Since we don’t have to submit everything we operate to the FCC for validation, we have no ‘validation costs’ to pass onto our end users. In short, the FCC, as a regulatory body imposes rules and restrictions on our use of wireless frequencies in the name of the greater good. This generally works very well, creating the ecosystem of ‘small cell’ give and take that we live in today. You are given the choice to make your own determination if analog video cameras, microwave ovens, X-Box controllers, etc should take priority or if your Wi-Fi should. Political challenges aside, we’re masters of our own domain. So what happens when someone does something outside the norm? What happens when someone violates the FCC specifications? What happens when someone fires up 10 watt outdoor analog video feed in 2.4GHz and points it at the broad side of a hospital? As it turns out, someone recently did just that. I was asked to assist with locating what was being detected as a whole bunch of analog video cameras that hogging up all of Channel 1 in 2.4GHz along the broad side of a hospital. As you could imagine, with a good 100 or so Access Points all excluding channel 1 (due to interference) from their channel plan, this meant that a two channel plan was all that was left (6 and 11). After much sleuthing, we determined that the signal was traveling well in excess of 10 city blocks! In my book, that certainly fit the bill for ‘obnoxious’. With more than a little hesitancy, I went to the FCC web page for complaints and filed one. We’re concerned with Wi-Fi Jammers. Once my complaint went off into oblivion, I’ll be honest with you, I didn’t expect to hear anything from them at all. Instead, a few weeks later, I got a letter in the mail with the usual FCC ‘devices must accept interference’ text that you’d expect from a Federal entity. I was heartened by the fact that I got a response however, and there was a ‘for more information call this number’. They offered, I did. The nice Federal employee took my call, listened to my acknowledgement of the letter, listened to my insistence the letter was insufficient, and listened to my complaint that there was something going on that the FCC clearly needed to get involved in. She thanked me for my time and stated that she would escalate my case. This was the last I personally heard from them. I was fortunate enough to have some contacts near the building that we suspected was generating the noise. Sure enough, a couple of weeks later, they informed me that a FCC field agent showed up asking questions. Shortly thereafter, the video camera signatures stopped being detected, the channel cleared up, and things got back to normal at my customer. The point of all of this is that you do have a friend in the FCC. They’re not the most communicative, timely, or ‘feel good’ organization I’ve ever worked with, but if you have no other choice, and you can prove reasonably that there is a strong need for them to get involved with a neighbor that being obnoxious, they will. Start to finish, once I engaged the FCC, it took roughly 2 months to get back to normal. Don’t expect them to be quick. Don’t expect them to believe you. Don’t expect them to understand what you’re saying. Do be patient. Do be persistent. Do be kind. You don’t want to make a Fed angry. You can prove beyond the shadow of a doubt that something beyond your sphere of influence is causing harmful interference to your Wi-Fi network.